In stock -This product will ship today if ordered within the next 7 hours and 21 minutes. Vitamin D3 (also known as cholecalciferol) is a fat soluble vitamin which plays an important role in maintaining optimum levels of calcium in the bloodstream. The majority of vitamin D in the body is created during skin exposure to sunlight, but can also be found in egg yolk, fish oils and oily fish such as salmon, herring and mackerel. Cholecalciferol is an animal source of vitamin D3. Vitamin D3 increases the absorption of calcium from food and reduces the excretion of calcium from the body. These effects ensure that calcium levels are maintained and allow adequate levels to be stored in bones and teeth. Vitamin D promotes healthy blood calcium levels and in turn may help bone strength. Vitamin D is also responsible for maintaining healthy muscles and nerves, and for maintaining a healthy immune system. Olive oil, gelatine, glycerol, purified water, Vitamin D3 (cholecalciferol), Color:Iron oxide. 1 Capsule per day, or as directed by a physician. 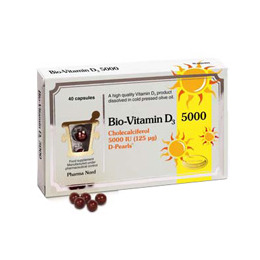 Below are reviews of Pharma Nord Bio-Vitamin D3 5000iu (125ug) - 40 Capsules by bodykind customers. If you have tried this product we'd love to hear what you think so please leave a review. This is my second pack and I think I can truly say I have more vim and vigour when taking them, likely S.A.D. but will also be taking during the summer months as I've discover that by using sunscreen my vit D absorption will be reduced. The price point is good for the quality, especially as it gets cheaper the more packets you buy. The pricing has become even more important as now there are 4 of us taking this vit D.
Also the size of the capsules are quite small so even those who have an aversion to taking things in tablet form should find a way of doing so without too much difficulty. The only reason why I scored it as a 4 is if you simply want vitamin D and are not fussed about the quality or the ingredients then there are cheaper products out there but if you want something in a purer form this is what you should go for.